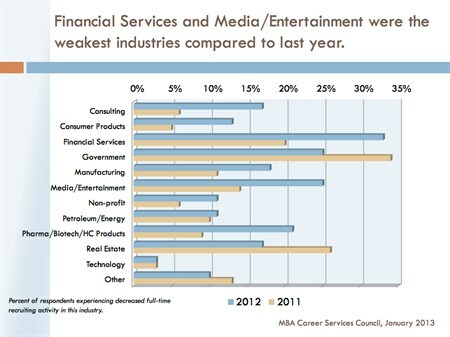 College Recruiting: Which Industries Are Hiring? Is the job market for MBAs starting to show signs of life? The most recent recruiting survey from the MBA Career Services Council (MBA CSC) seems to suggest that it is—with business schools across the nation reporting an uptick in on-campus recruitment activity across a variety of industry sectors. According to the MBA CSC Fall 2012 Recruiting Survey report, some 45 percent of respondents reported an increase in on-campus recruiting activity compared to the same period in the previous year. A further 31 percent reported that activity had been flat, leaving just 14 percent of schools reporting a downturn in recruitment activity. An even better sign, at least for jobseekers, is that 58 percent of schools reported an increase in the number of full-time job postings on campus, compared to just 11 percent of schools reporting a decrease. So far, so good—especially considering that 89 percent of the 76 schools that reported were based in North America. Where the report really gets interesting for those who haven't committed to a specific industry or career field, however, is in the data it presents on industry hiring trends. As the following chart from the report shows, industries such as consulting and technology have been ramping up full-time hiring efforts in recent years. Note that around 60 percent of respondents reported an increase in on-campus activity in those industries in each of the last two years. Even where this chart seems to show pullback—like in consumer products—the news isn't all bad. Sure, fewer respondents reported increased activity in 2012 than did in 2011. However, it's important to note that the chart shows increases in activity, not absolute levels. So even though "only" around 30 percent of respondents noted an increase in 2012—that still indicates better results than in 2011. 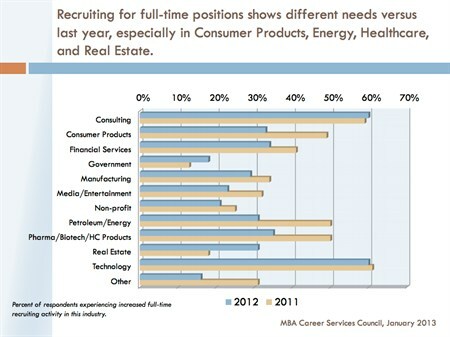 The flip side of that is shown in this chart, which details decreases in full-time hiring activity in the same period. (Note that the chart scale has changed). So what, if anything does this tell us? Well: the obvious takeaways are that technology and consulting firms are seriously ramping up their recruitment efforts—something that is not surprising given the moves we've been seeing of late in the wider business world to place technology closer to the core of company strategy. Again, while this doesn't give any sense of the sheer numbers of positions being advertised, it is nonetheless interesting to note the changes in recruiting activity in areas such as government, consumer products and real estate—developments that again seem to chime with wider themes of cutbacks in federal spending and something of a rebound in the wider economy, and the housing market in particular. As for positions in media and entertainment—that also seems to be of a piece in a climate where newspapers still can't figure out sustainable revenue models, leading social networks can't turn a profit, and the publishing industry continues to suffer. All told, then, things would appear to be looking up for MBA students on the job front—a statement that is long overdue, and extremely welcome. Let's just hope that the numbers not show in this survey—the total jobs on offer—are following a similarly optimistic path. Check out Vault’s 2013 Pro Bono Guide!